The Doulton company started as a partnership with Watts in S.E.London producing mainly saltglazed stonewares and terra cottas at the beginning of the C19th. From that vigorous market founded not least on the production of Drainage pipes required for the industrial growth and population explosion of the first part of the C19th., the Doulton company bought out complete, the Burslem company of Pinder & Bourne for the sum of £12,000 in 1878. 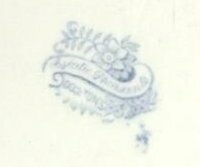 With the flotation as a Limited Company in 1882 both the Burslem Works and the Lambeth works traded under the same Banner, although each factory continued its traditional ceramic production. The Lambeth works established a new and important reputation when they introduced their highly innovative decorative wares in stoneware after 1870. The production of "Asiatic Pheasants" wares would appear to be between 1882 to 1902 although the pattern may have been produced later but probably not much later.